HTML documents are composed entirely of HTML elements that, in their most general form have three components: a pair of tags, a "start tag" and "end tag"; some attributes within the start tag; and finally, any textual and graphical content between the start and end tags, perhaps including other nested elements. 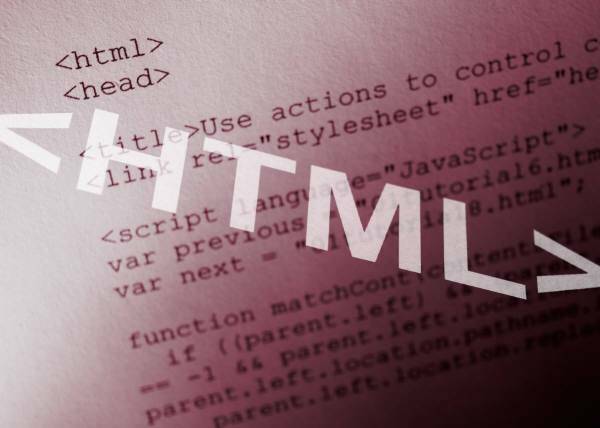 The HTML element is everything between and including the start and end tags. Each tag is enclosed in angle brackets. The browser displays the image where the <img> tag occurs in the document. If you put an image tag between two paragraphs, the browser shows the first paragraph, then the image, and then the second paragraph. A table is divided into rows (with the <tr> tag), and each row is divided into data cells (with the <td> tag). td stands for "table data," and holds the content of a data cell. A <td> tag can contain text, links, images, lists, forms, other tables, etc. CSS isn’t technically HTMl code, it’s a different syntax and it serves a different purpose. However, a lot of the functions that, ten years ago, would be done (awkwardly) in HTML are now done in CSS. CSS can determine everything from the size of your text to the gap around your images to the layout of your site. All of this is controlled within either one or a handful of stylesheets. Editing these stylesheets can have a drastic impact on your site, your posts and that is a double-edged sword. For one, they are simple way to fix problems that you have with your site or improve your look. On the other hand, they are a wonderful way to mess up your whole blog. Hi nice blog really good. thanks for this wonderful and informative blog .